(Nanowerk News) A new nano device, capable of immediately detecting fungus that attacks wood, has been developed by a team of Polish scientists. Aspergillus versicolor is very a common mould that is an indicator of moisture problems in wood and other building materials. The fungus is known to produce carcinogenic toxins and cause eye, nose and throat irritation. 'Until now, the attack of the fungus on wood was only visible when it was so advanced, that the results were visible to the bare eye,' said Jerzy Langer of the Laboratory for Materials Physico-chemistry and Nanotechnology in Poznan, Poland, who runs the research programme. Before, detecting the presence of the fungus early on required taking samples to the laboratory for analysis under the microscope. With the fungus nanodetector, the days of sampling are over. 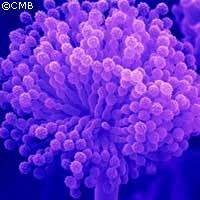 The aspergillus versicolor is detected using nanofibres, whose physico-chemical properties change in the presence of the fungus and spark an electrical signal. 'Our method of checking fungus presence on wooden surfaces is entirely non-invasive, which means it can be used in analysing valuable wooden objects,' said Professor Langer. Thanks to its compact design, the device can be used anywhere. 'This device should be a vital piece of equipment for historical conservators, as well as for people interested in renovating, building or buying a house or flat, as this enables detecting fungus, which is often harmful to its residents, even in new construction elements,' explained Professor Langer.